This recipe mimics Starbucks' pumpkin loaf, but can be made gluten free. In a large bowl combine flour, sugar, salt, baking soda, salt, spices, and xanthan gum (if using). Stir well to mix. In a separate medium bowl, mix together eggs, oil, canned pumpkin, and vanilla. Add wet ingredients to dry ingredients and stir well, until the batter is smooth, but do not over mix. .
Pour into a 9" x 5" loaf pan that has been sprayed with non-stick spray, and sprinkled with a little flour. 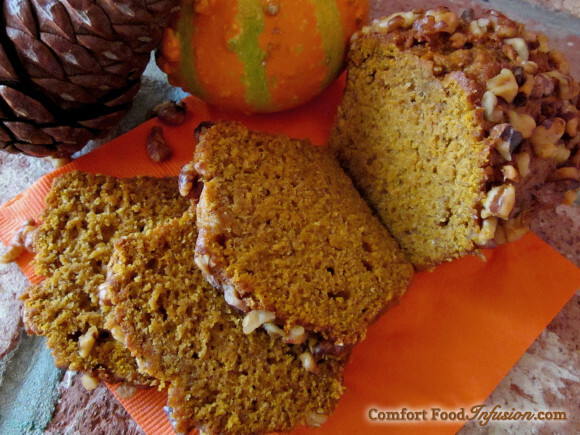 Sprinkle pumpkin or walnut seeds on top of bread. Bake at 350° for 50 to 60 minutes, or until a toothpick comes out clean when inserted into the center of loaf. Remove from oven and cool for about five minutes, and then remove the pumpkin bread to a cooling rack. Visit https://comfortfoodinfusion.com/gluten-free-flour-mix/ for my gluten free flour mix. The version used in this recipe is the oat flour version. It is best to make a large batch of the flour and measure out the 1 and 1/2 cups needed for this recipe.